ballet master, choreographer and teacher, was trained at the Pennsylvania Ballet and the Philadelphia Dance Company (Philadanco). 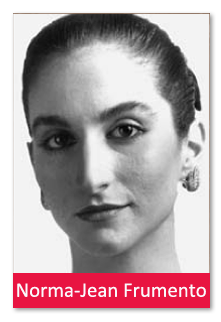 This dynamic member of our staff received a Bachelor of Fine Arts degree in dance from Temple University, and has since performed with the Philadelphia Civic Ballet, Ballet South and Philadanco. As a soloist with Philadanco, she performed throughout Europe and the United States, and expanded her theatrical career in an entirely different direction as a featured dancer in numerous music videos and commercials. Norma Jean is extremely proud of her two lovely daughters. Vicky graduated from The Fashion Institute of Technology in NYC, and is working in NYC in the fashion industry. Claudia graduates in June from Stockton University with a BA in Business. Both girls were dedicated students at the Marcia Hyland Dance Center. A skilled professional, Norma Jean is an exciting addition to our staff. She “lights up our stage” with her presence and continues to inspire our students to achieve their own personal goals!